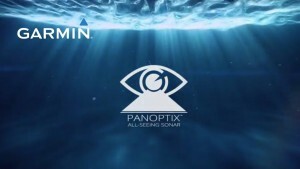 When I first learned about Garmin’s new Panoptix sonar early this year I was excited. 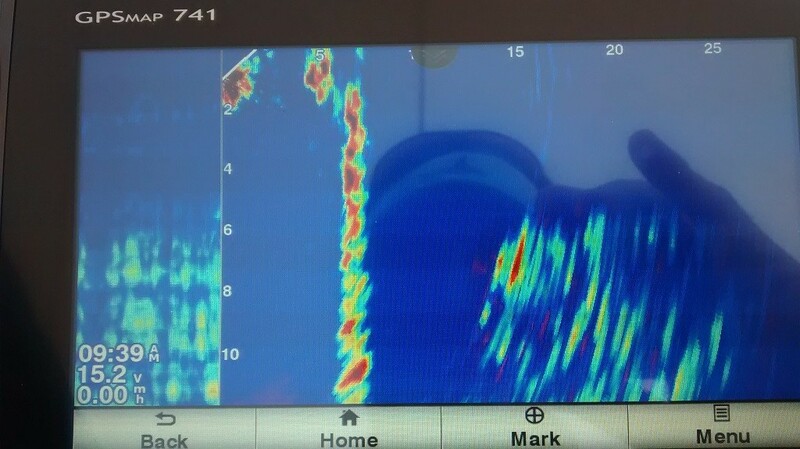 Real-time multi-beam sonar at a consumer price point. Up until now, multi-beam sonars were strictly within the reign of deep pocket organizations. I’ve had first hand experience with the technology during my work on research ships, but now that technology has come so far down in price that even meer mortals could afford it. Although Panoptix is targeted at inland fishermen, my hope was that it might be turned into a cost effective sonar for ROV navigation. For months I scoured the internet and spoke with Garmin tech support until I found enough information to decide that this might just work. The specs looked good and the price looked even better. The basic Panoptix system is composed of a transducer and display unit. All the sonar electronics are inside the transducer and it communicates with the display via ethernet. The display unit I chose includes a GPS and chart plotter, but Garmin offers a wide variety of displays with different options. All together I paid $2,500 which is a lot for a fishing sonar, but a bargain for an ROV sonar. Garmin had the fore thought to beef up the Panoptix transducer to specs well beyond what the average fisherman would require. The transducer is liquid filled and rated to 93 meters depth, the communications protocol is Ethernet and both topside and transducer units sip DC power at less than an amp. All the specs and information sounded good. All that was left to do was to buy one. Here’s some screen shots from my first day of testing the unit. 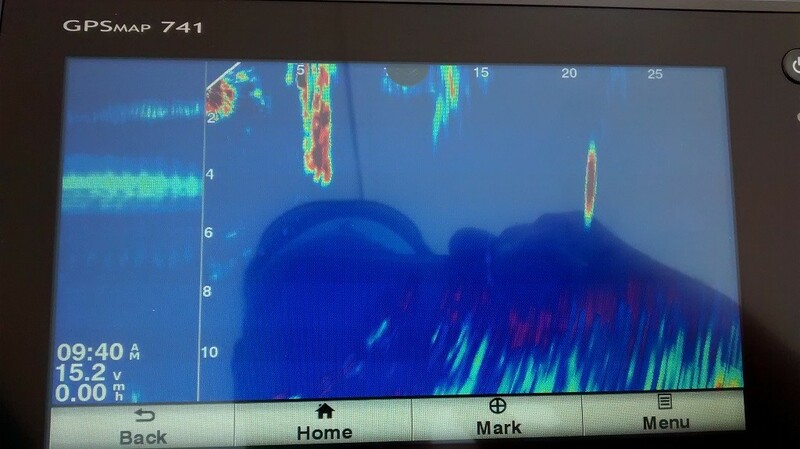 This first test was from a fixed mount next to my boat in the marina. I know this particular section of water fairly well as I often test ROVs in this very same spot. This first shot is of what Garmin calls its “TruView 3D” display. The water was roughly 15 feet deep. Although Garmin claims the Panoptix maximum range to be 300 feet, I found it to be closer to 100 feet in the conditions here. Here’s another shot that shows some of the structure, specifically the concrete piling about 5 feet from the transducer and the floating concrete dock roughly 60 feet away. Both show pretty clearly as does the harbor floor. 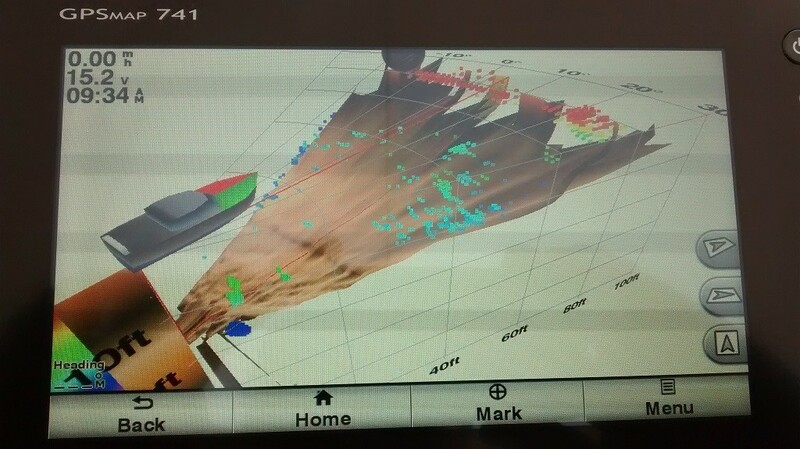 Here’s a shot of what Garmin calls the “LiveVu 2D” display. This view gives you a “real time” vertical 90 degree slice of what’s ahead. By turning the transducer left and right, I can home in on a target, in this case the concrete piling. Here’s another “LiveVu” shot, this time you can clearly see the rudder on the boat next to the transducer almost exactly at the top 5 foot mark. First impressions of Garmin’s Panoptix are all positive. My plan is to power the transducer with a LiPo battery and integrate its Ethernet into an ROV’s communications system. I’ll post more details and results in a future blog post. 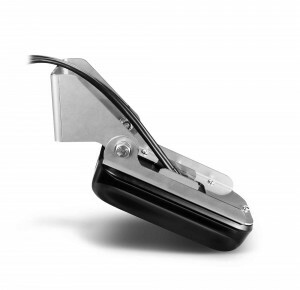 Visit the Garmin Panoptix web page for more information. Garmin has released numerous software updates for both the GPSmap 741 display and Panoptix PS31 transducer since my last post. I’ve submitted several suggestions that would make using the Panoptix better for our purposes and I’m hoping they will be implemented. At the same time Garmin also released a new Panoptix transducer, the PS21, which is smaller and 30% less expensive than the PS31. Although it doesn’t support RealVu 3D (3D multibeam) it supports “LiveVu-Forward” and “FrontVu”. Lastly, as some may recall that one of the things I first learned about the Garmin system was that the transducer and display communicate via an Ethernet clone they call “Garmin Marine Network”. To see if any of the components might be recognized by my computer network I connected both the PS31 transducer and GPSmap 741 to a router. The router immediately connected with the 741 but not the transducer. I’m still working on how best to integrate the transducer and ethernet comms into my ROV. I’ve got a couple ideas but nothing that I’m particularly happy with.